Uncompromising Custom Quality - 106sqm Approx. Internal Size More than just latte-strip located, more than just architect-designed, this is custom-crafted apartment living at an iconic Elwood address. Oriented for a second-floor city-glimpse from this landmark Ewert Leaf-designed/Steller-constructed development, this spectacular sky-terrace apartment goes above and beyond original specifications with a customised floorplan, bespoke detail and a northerly outlook over cosmopolitan Ormond Rd. ...moreReconfigured with a focus on entertaining living and master luxury, this exceptional two bedroom plus study nook, two bathroom design adds a full butler`s pantry (with dual Vintec fridges) beside an up-sized De Dietrich appliance and marble kitchen... and redesigns the master as a vast domain encompassing a lightwell-study nook, robed dressing area and lavish dual vanity ensuite (with double shower and sculptural egg-bath). 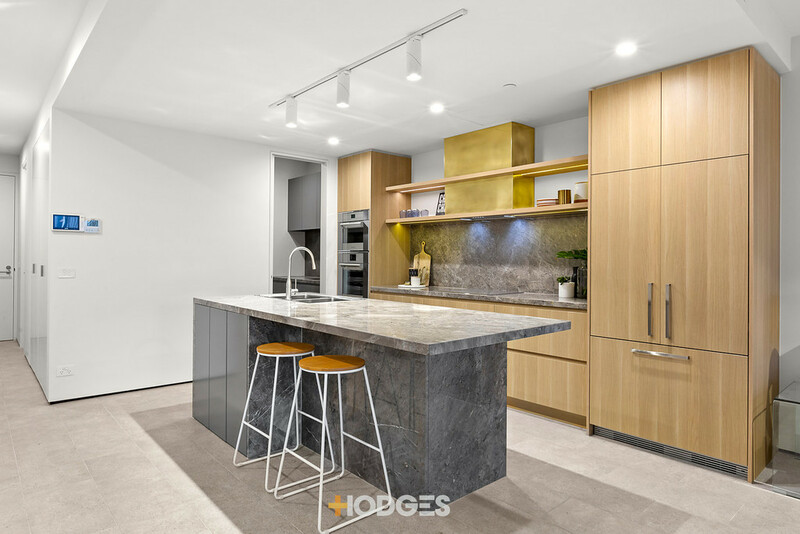 With living flowing seamlessly to a vast sea-breeze city-sparkle terrace, the apartment has been architecturally up-scaled with full-height doors, additional Italian Poliform cabinetry and an extended marble cantilever island for the kitchen. Customised with hand-crafted double doors to the ensuite and vast commercial bi-folds to the terrace, this bespoke apartment goes above and beyond with Rogerseller bathroom fittings and tiles and Apaiser vanities. About Space track lighting shines on concrete-style tiles and premium carpets, while airy sheers and custom blinds cover tall north-facing windows.